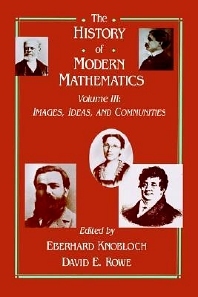 This volume contains nine essays dealing with historical issues of mathematics. The topics covered span three different approaches to the history of mathematics that may be considered both representative and vital tothe field. The first section, Images of Mathematics, addresses the historiographical and philosophical issues involved in determining the meaning of mathematical history. The second section, Differential Geometry and Analysis, traces the convoluted development of the ideas of differential geometry and analysis. The third section, Research Communities and International Collaboration, discusses the structure and interaction of mathematical communities through studies of the social fabric of the mathematical communities of the U.S. and China. Images of Mathematics: Historiographical and Philosophical Issues: J. Lutzen and W. Purkert, Conflicting Tendencies in the Historiography of Mathematics: M. Cantor and H.G. Zeuthen.I. Grattan-Guiness, A New Type of Question: On the Prehistory of Linear and Nonlinear Programming, 1770-1940. V. Peckhaus, Hilberts Axiomatic Programme and Philosophy. Differential Geometry and Analysis: R. Tazzioli, Rudolf Lipschitzs Work onDifferential Geometry and Mechanics. P. Ullrich, The Proof of the Laurent Expansion by Weierstrass. P. Ullrich, The Riemann Removable Singularity Theorem from 1841 Onwards. Research Communities and International Collaboration: D.D. Fenster and K. Parshall, A Profile of the American Mathematical Research Community: 1891-1906. D.D. Fenster and K. Parshall, Women in the American Mathematical Research Community: 1891-1906. D. Zhang and J.W. Dauben, Mathematical Exchanges Between the United States and China: A Concise Overview.